First off, I wanted to include a more detailed illustration on how to grip a dagger, just to make it clear how these attacks are made. 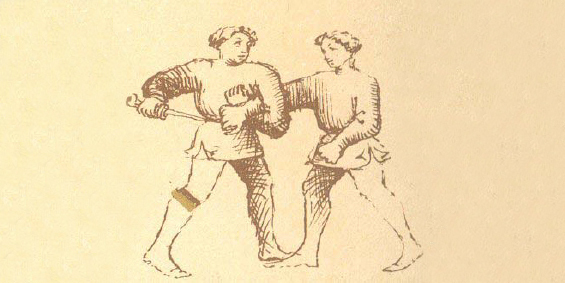 Of the four dagger attacks (mandritto to the left side of the head, riverso to the right, fendente to the middle and sotto to the stomach) only the last, the rising thrust to the stomach, uses a different grip. As you see, the thumb is furthest from the blade. The palm faces upward as pictured above during the mandritto attack, downward when doing the riverso attack. Now that we’re all clear on the attack, it’s time to defend against it. First goal: stop the dagger speeding towards your skull. The defence against the mandritto attack has you extending your left arm to stop the dagger, but that won’t work this time. The teacher explains that because the dagger is now on your right side, your left hand can’t really reach it properly. Your right hand, however, can. You extend it fully and stop the attack in its tracks. So far it’s simple enough, and that’s where we first stop. We’re told that it’s possible to defend against a riverso attack in the same way we would against a mandritto, only that we use the other hand. Extend and block, then twist the hand to get the dagger. That sounded a bit too easy, didn’t it? The teacher has another technique up his sleeve, of course. We’re shown another technique. After stopping the attack we’re told to lift our left hand, grab the dagger (still held by the opponent) by the tip and twist it away from ourselves. While doing that, we draw his arm closer and pin it under our left shoulder. Once we’ve forced the dagger out of the opponent’s grip, we let go of their wrist and shift the dagger into our right hand. It’s now not held in the manner pictured earlier (I made the mistake of doing that at first), since in this situation that limits your reach. This time your thumb is closest to the blade. With the oppontent’s right arm still firmly under your left one, you strike a sotto, a rising thrust to the stomach. And… That’s it. Sort of. There’s one thing in this that I can’t seem to wrap my head around. As we practice this exercise, my pair begins to shift back after she’s got my arm pinned, doing a sort of volta stabile while still facing my way. It works splendidly, pulling me out of balance and forcing me to bow low. In that position there’s nothing I can do to stop her from stabbing me. I begin to mimic what my pair does, thinking that I had somehow daydreamed past this part while the teacher was demonstrating. In a few moments our teacher tells us to stop, and shows the exercise again. “You don’t need to turn”, he says. Turns out that it’s unnecessarily difficult to reach the opponent’s stomach when leaning away from them like that. So we go on, not turning. Splendid, right? But I’ve got a nagging doubt. A few days later, when practicing with my father, we realise what bothers us. If we don’t turn, there seems to be nothing keeping our opponent from just wrenching his arm free and punching us in the gut. Even my father would have problems really keeping someone’s arm pinned under his, not to mention a skinny little thing like me! Not only that, but our opponent isn’t even out of balance, so if he couldn’t get his arm free, he should still have no problem devising some other way of fighting back. Like pushing us out of balance, for example! This wasn’t really a problem during the class: everybody meekly agreed to have their arm held in place by the other. But in a real medieval fight? No way your opponent wouldn’t struggle for his life. I’ve gone on for long enough. Long story short: we don’t seem to have any control over the opponent in this exercise. Unless he’s suicidal, this shouldn’t work. I decided to ask the teacher about this next week. I’ll let you know how it goes. This entry was posted in Beginner's Course, Dagger, Week 3 and tagged dagger, dagger defence, defence, exercise, fiore, fiore dei liberi, health, Italian school, mandritto, medieval, middle ages, riverso, sword fighting, sword school, swordsmanship, third remedy master, training by mephet. Bookmark the permalink. That’s very good thinking on your part. My husband would probably have come to the same conclusion. You do what you need to do to disable your opponent, and if that means breaking stance to put him off balance, then by all means do so. Keep up the good work! I’ve seen this, or something similar, in a few how-to-disarm videos, and thought, that’s nice, but it can’t be that easy. I figured maybe slowing down the movements for teaching sake made it seem ridiculous.